Founded in 1790 as the Journal der Physik by Albrecht Friedrich, then a professor at the University of Halle, it claims to be the oldest physics journal in the world. 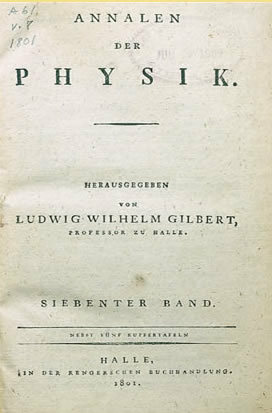 It became the Neues Journal der Physik in 1795 and finally the Annalen der Physik in 1799 when Ludwig Gilbert became editor. Gilbert was followed by Johann Poggendorff; Gustav Heinrich Wiedermann followed Poggendorf; Paul Drude succeeded him; Wilhelm Wien came next, and Max Planck was editor between 1907 and 1943. This "genealogy" was common to journals of the time; the success of the journal depended on strong editors and during their tenure the journal was often referred to as if it were personal property ("Poggendorf's Annalen or Wied. Ann.). The Annalen was unusual for its age in that references were actually made as footnotes, rather than as casual mentions within the text of the article, and the journal titles were abbreviated.